I try now from time to time to give some hints / examples how to solve concrete customer requirements with our time valuation engine. Our time valuation engine is very flexible – but flexibility means also that you need to know how to apply it. And this little blog shall help. Employee works in different shifts. Some are 9 hours long, others 11 hours. And he needs to work on public holidays. When he works on public holidays he gets not only for each hour worked a payment of 1.5. But he additionally gets the planned hours completly posted into a time off in lieu account – even if he has worked not the full shift but only 6 hours or even more than his shift. So, employee works 10 hours on a public holiday where the shift was planned to be 8 hours. He gets 10×1.5 overtime premium paid out. On top he gets 8 hours posted into his Toil account. I skip the explanation of the first part, how to detect the public holiday in time valuation (via the “filter” valuation type) and I skip the explanation on how to generate the 1.5 overtime payment. This is already well explained in examples in our time sheet implementation guide. Let me focus on the new feature that was delivered with Q3 release, the new valuation type “Compare Threshold with Comparison Group to Route Input” and that helps to post the planned working time into a time off in lieu account (TOIL) on top of the 1.5 payment. So lets assume you have in the time valuation rules detected the situation where an employee has recorded working time on public holiday. I used in my example to make it simpler a dedicated time type called “Work on public holiday”. 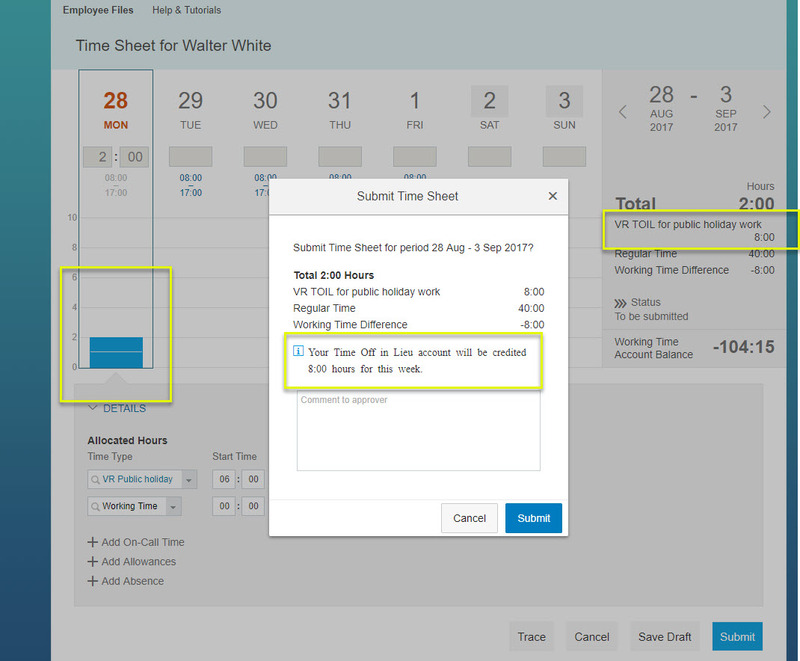 This is done only for simplification of this example – you would let your employees record his normal working time type and fill the input group in my example only when it is a public holiday and the employee has recorded working time. What is this rule doing now? The new valuation type compares the time type group stated in “Comparison group” against a fix value 0. My comparison group is a dedicated timetype – and here would be your calculated group that contains only the filtered working time on a public holiday. So, as soon as there is value in your work on public holiday group (triggered by the comparison with fix value 0) the “Route” function reads the input time type group and routes its hours value to the time type group defined in the “time type group above” field. This is hard coded behaviour of this valuation type. In the “input time type group” I have assigned a time type group that contains the scheduled working time of the employee less the breaks. (You need probably to calculate this value in your system, too. But how this is done is described in the implementation handbook). So this means in easy words: when working time exist on a public holiday, the planned working time of the day is taken and sent to the time type group above. This is done regardless if the employee records only 1 hour or 10 hours. This above group can now be a paytype to pay out the hours or you can post them to the TOIL account. The important part of the route function is: it takes the value in the “Input time type group” section and is sending (routing) it to the defined “Time type group above”. This is however only done based on the conditions defined in the rule. And the conditions are: when in the comparison time type group per day a value is detected that is bigger than 0. To post it to the TOIL account (especially when you want to payout the 1.5 portion) you need to set the time type group that you use as above group to “Overtime premium”. When in the employees job information the “default overtime compensation method” is set to “Time off” or “Payout and time off” he gets the hours converted into a time off in lieu account. Lets have a look onto the result. I record 2 hours of my timetype “work on public holiday” (again, you don´t need a dedicated timetype to cover this, you can detect this constellation with the filter groups), and 8 hours are booked to the to the Time off in lieu account. As you can see, the employee got a planned time from 08:00 – 17:00. So, this would be 9 hours. But this contains the 1h break that I have deducted previously in my time type group “Scheduled working time without breaks”, hence it is 8 net hours. When the employee has next week a different planned working time, than this value gets posted. When your employees don´t have different scheduled working time per day, but only the same planned times than you can make it easier. You can post always a fix value then and don´t need this route function. I gonna write on this requirement in another blog. Have fun implementing EC time valuation.